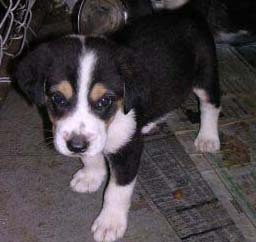 Blazer is the largest male of the litter of Australian Shepherd puppies. He is smart, adorable, very quiet and is just a great little pup. He is very crate trained. In fact, he is in an extra large crate with no accidents. Please see our puppy guidelines before applying as we require someone to be home with him. 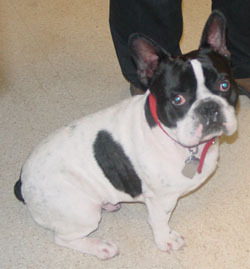 Buster is a one year old male French Bulldog who was given up due to the owner's severe allergies to him. His head is as big as an English Bulldog, but he's generally a large Frenchie. The owner said she got him from a breeder who wouldn't take him back. The breeder got him from another "breeder" in Indiana, so possibly he has puppy mill origins. He is a happy little guy, quite the character with a comical personality. There's nothing not to love about this little guy. Well, actually he's not so little at 35 lbs. He seems to be housetrained, never barks and seems to be quite happy. When we got him, he smelled awful and his skin and ears were itchy. After his bath he was dancing around so happy to be clean. He even played tug-o-war with the towel. We're treating his ears too as he must have had ear mites for a long time. His ears are very sore from months of infections and scratching, so our holistic vet treated him with ozone theraphy and he's feeling so much better. This breed has skin allergies and we think he is no different so he is on the "all raw" diet. We would be very interested to talk to anyone who can offer him a similar diet and anyone who has a holistic vet who won't use predisone and other dangerous drugs. This dog is a charm and well worth finding the right home. Serious inquiries only. 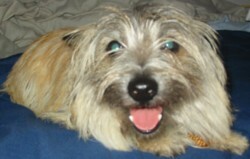 Calvin is an adorable, one year old (just had his birthday in July) purebred Cairn Terrier. He is loving and somewhat submissive (loves to roll over for tummy rubs), Loves to PLAY PLAY PLAY, loves to go for walks, and adores any toys, especially those that squeak. He enjoys playing fetch. He loves nothing better than being with his person, tho! Calvin ADORES people and all the attention he can get. Calvin is still a puppy and has the terrier energy. We are hoping to find someone who has had experience with the terrier breeds and knows them well and their exercise and energy needs. He loves to play and is good with other dogs. Calvin weighs about 12 lbs, which is surprising, as I have small dogs and he seems light as a feather. He's very lean and always "busy". He does settle down, tho, and loves to sit on the arm chair or sofa next you, or be nearby in the same room. He is housetrained and goes on puppy pads. However, he prefers to go outside and since he's so small, needs to be taken out several times during the day (we're looking for a stay at home or work at home person, and/or someone who might take him to work with them every day). Calvin was loved very much during his first year, and that is apparent in his temperment. His owner gave him up becos she is a single mom, raising 2 teens who have to be constantly carted around to activites and such...and she works 2 jobs. She felt that it was not fair to Calvin not to be able to give him more of her time, and the kids liked Calvin of course, but were not willing to put any time into training him. Calvin is a happy go lucky puppy, he needs some basic obedient training -- to learn his manners and his limits (ie he likes to beg for food and is very food oriented. You have food? He's THERE!) His high interest in food will be a great enticement for training! And he is very willing to please. We require (as a term of adoption) that you attend formal obedience training for Calvin (and all our puppies). So many puppies are turned into shelters and rescues because their people never spent any time training them and as adolescents, they become too much of a handful. Calvin is very sweet, but if he learns a few manners and knows some limits, he'll make a wonderful wonderful companion for a special adopter. We are looking for an adopter who has the time to lavish on Calvin and he will make a GREAT companion, willing to go any and everywhere with you! Preference will be given to those with terrier experience. Please read our "how to adopt" page regarding our adoption process and other important information. Thank you!